Headliners Book Event with Dan Abrams: "Lincoln's Last Trial: The Murder Case that Propelled Him to The Presidency"
Dan Abrams - Lincoln's Last TrialIt is the summer of 1859 and inside a small courthouse in Springfield, Illinois, a 22-year-old man named Peachy Quinn Harrison is on trial for murder. What might have been a quiet local case is suddenly thrust into the national spotlight when rising political star (and rumored dark-horse favorite for the presidency) Abraham Lincoln is hired to defend the young man. 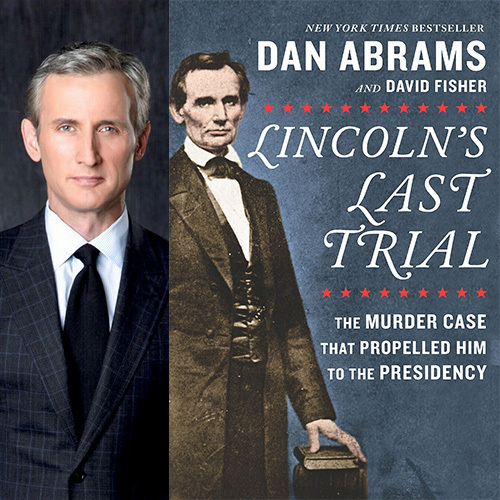 In “Lincoln’s Last Trial: The Murder Case that Propelled Him to The Presidency,” author and ABC News chief legal affairs anchor Dan Abrams throws the reader in the juror’s seat and unravels the pivotal, high-stakes proceedings in a play-by-play of history that would rival today’s most riveting courtroom dramas. Abrams will share “Lincoln’s Last Trial” and why he believes this historic legal thriller is relevant today at a National Press Club Headliners Book Event on Monday, September 24. Books will be available for purchase at the event. Proceeds from book sales will benefit the non-profit affiliate of the Club, the National Press Club Journalism Institute, so we kindly ask that you leave all outside books and memorabilia at home. Dan Abrams is the chief legal affairs anchor for ABC News and host of “Live PD” on the A&E cable network. Abrams got his start in cable news covering the OJ Simpson trial and the trials of Dr. Jack Kevorkian for Court TV. He moved to NBC News in 1997 and was eventually named Chief Legal Correspondent, and later, the host of his own show, “The Abrams Report,” on MSNBC.